Tropical Depression Jelawat, a newly-formed tropical cyclone over Western Micronesia is expected to strengthen into a Tropical Storm and enter the southeastern border of the Philippines by this afternoon (March 26). However, this storm is too far away to actually affect any part of the country. 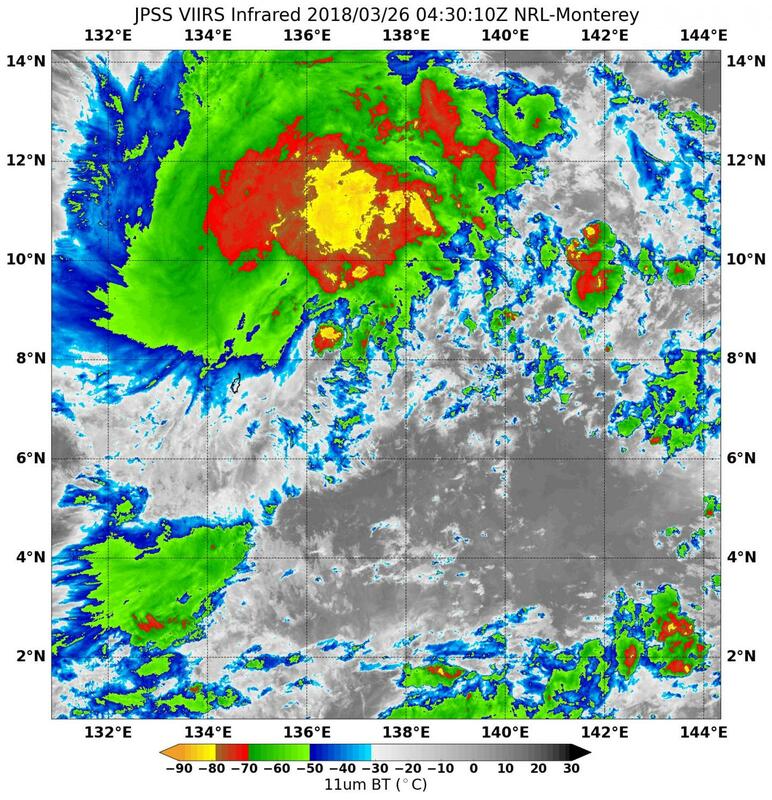 The developing center was located over the western part of Micronesia (near 6.6N 139.5E), about 560 km east of Koror, Republic of Palau or 1,465 km east of Mati City, Davao Oriental. Tropical Storm Jelawat is predicted to gradually veer northwest, and later north and northeast. The system will intensify to 55 knots before starting to weaken. This image was taken by NOAA/NASA's Suomi NPP satellite on March 26, 2018. The Visible Infrared Imaging Radiometer Suite (VIIRS) of instruments captured an infrared image of the storm. The Suomi NPP satellite is a joint mission between NASA and NOAA. The Suomi NPP is a satellite that carries five very different instruments to monitor the environment on Earth and the planet's climate. NPP measurements will be used to map land cover and monitor changes in vegetation productivity. NPP tracks atmospheric ozone and aerosols as well as takes sea and land surface temperatures. NPP monitors sea ice, land ice and glaciers around the world. In addition to continuing these data records, NPP is also able to monitor natural disasters such as volcanic eruptions, wildfires, droughts, floods, dust storms and hurricanes/typhoons. In all, NPP monitors the health of Earth from space–providing continuity to decades-long records and setting the stage for future Earth science missions.